The following originally appeared on 4/27/09 at Exit 51. Did you know I can see into the future? Sometimes, I can. 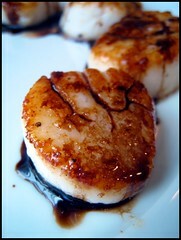 And in your future I see scallops with balsamic glaze. This will not happen right away. No, it will take some time. But I do see you together. How can I possibly know this? I know because this was a recipe I tested for Cook’s Illustrated. The final recipe should appear in CI sometime later this year. Until then, you will just have to take my word that I think the two of you will really hit it off. I wonder whether the published version will offer suggestions about how to use leftover balsamic reduction? Because I’ve got a small container of it sitting in my fridge. 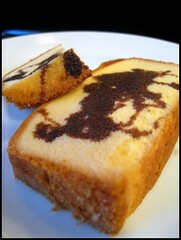 So far, the only idea I’ve had is to spoon it over sliced pound cake. I’m not sure which is the better idea, making more scallops or getting more pound cake. This seeing the future is tricky business. The pizza idea sounds scrumptious.